You’re a busy entrepreneur with a lot on your plate. But with so much to do, it can be difficult to stay focused. Your mind starts to wander. You start to get stressed out. Luckily, staying focused in today’s extremely busy work environment doesn’t have to be impossible. Here are 6 tips that can help you focus and get things done quicker. At the beginning of each day, create a specific list of everything you must do. This can be done in a physical planner, on your computer, or even on a Post-it note. The point is to write down what needs to be done, so you don’t forget you have to do something. It’s important to have long-term goals, but is also very important to create short-term ones; goals that you want to accomplish each week. Think of this as a slightly longer to do list. Make a list of what you want to do each week, and at the end of the week, go through it to see what you actually accomplished. Make sure you check this list throughout the week to help you stay on track. We love routines. Even as babies we are wired to depend on routines. Even if you feel like your days are all over the place, there is some pattern in there. Take a look at your planner or calendar and look for those patterns. Do you like to get things done early in the week? Later in the week? Use your own work patterns to create a routine that works for you and will help keep you focused throughout the day. Time blocking is a bit more structured, but it’s designed to help you really focus on the task at hand. It’s reserving segments, or time blocks, in your calendar for each task. Within these time blocks, you are to focus on that specific task – and only that task. The amount of time you allot for each task will vary from task to task. For example you may schedule just 15 minute to answer emails in the morning, while you schedule an hour and a half for other business tasks later in the day. 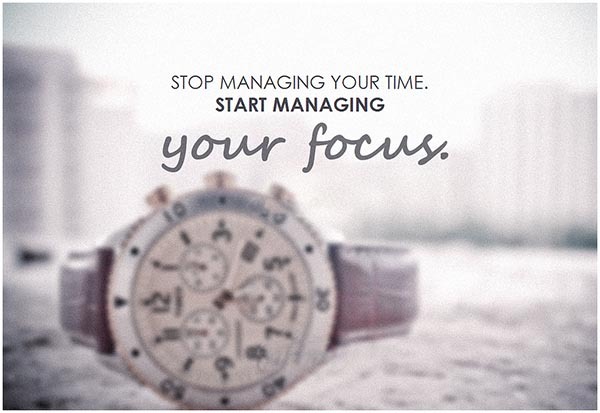 Time blocking is not designed to stifle your day. Instead, it’s set up to just focus on a specific task for short amount of time so you can get it done. If traditional to-do lists don’t cut it, try online tools to help keep you focused. Try task management dashboards like Trello or Asana to help you see what you need to do, and allow you to cross them off when you’re done. Lastly, stopping to take a break can really help you stay focused. Sounds counter-productive, but it really works. When you’re starting to feel overwhelmed, it’s hard to keep your focus. This is the perfect time to take a short break. Go for a walk, grab some lunch, even take a power nap. You will return to work feeling refreshed and much more ready to focus. Keeping your focus when there is just so much to do can be difficult. But it’s not impossible. Using these 6 tips can help keep you on track to get things done faster.